My class wrote stories today. They wrote without screens, keyboards, or the net. It was just ink, paper, and laughter. Amazingly, analog still works. I stumbled across the website Folding Story a while ago after @rmbyrne tweeted about it. I stuck it on my future lesson plan ideas list to get back to later. Today was later. I knew it wasn’t an “educational” site, so I was already a bit cautious. I looked over some of the newest folding stories, and was shocked to see some very unsavory topics about various body parts on the first page. Hmm. I knew it was time to shift pedagogical gears. Pen and paper started looking very nice. 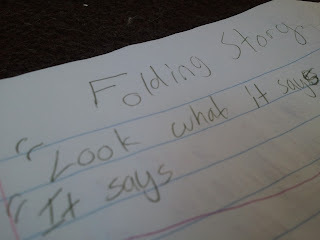 I had them get their writing notebooks to use as think-paper before they committed their sentence to the loose leaf notebook paper that would contain the Folding Story. The first round was the story starter. Each student picked a dialogue, action, thought, question, or onomatopoeia to begin their story. They had to stop after four minutes. Next, the students moved. The story stayed put on the desk and the students switched spots. They grabbed their notebook and pen and found a different desk. The second round of the story was a sentence and a bit more on the setting. After four minutes, the students moved to a new desk. The writing for the following rounds were: a new character, the problem, the (re)solution, and finally the ending. For the final ending round, I had the students go back to their desk with the original story that they began. Afterward, the students read a few aloud to the class. I asked the co-authors to raise their hands so the class could see who else helped out. Laughter filled the room during share time. Some of them actually came out quite well. A few of them- not so much. A couple students got upset when they found out that their original story had been taken in a completely different direction. All in all, it was a success in story telling. Having to be succinct and work within a time limit forced the students to think about the core elements of a story. It was in these parameters that some students were able to let their creativity shine. But the best part was not having to hear about how Internet Explorer stopped working… again. Go give it a try. Digital or analog, stories can be much more fun when told by a group.